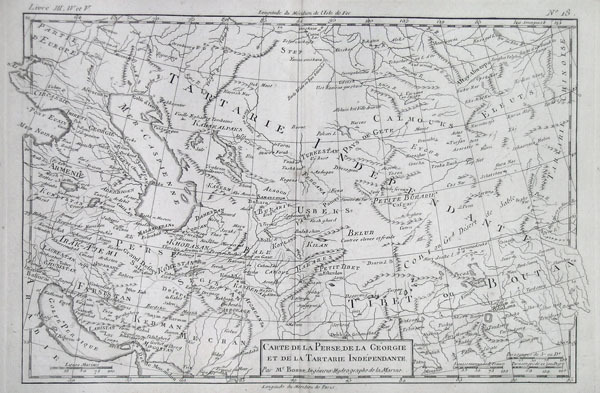 This remarkable map of Tartary, or Central Asia from the Black Sea to Tibet, by the mapmaker Rigobert Bonne was made in 1780. Bonne was the successor to Bellin as head Engineer of the French Hydrographe del la Marine Department. Includes Iraq, Kuwait, Afghanistan, Iran, Uzbekistan, Tibet, and Bhutan. Towns, churches, cities and mountains are depicted as miniature representations of themselves. This map is highly detailed and beautifully crafted.